Content marketing for healthcare falls under a distinctive marketing strategy called inbound marketing, which requires integrity and medical knowledge on the part of the writer. According to a Pew Internet survey, the third most popular activity people do online is to check for answers to health questions–after checking e-mail and using a search engine. That’s pretty big news for anyone concerned about content marketing for healthcare. What you’re putting online will very likely be read, especially if it contains detailed information about common health problems. 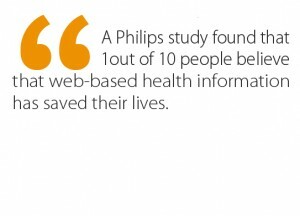 In fact, a Philips study found that 1 out of 10 people believe that web-based health information has saved their lives. If they hadn’t accessed that information, they’d now be severely incapacitated, or dead. Content marketing for healthcare thus has an important task, which is to provide accurate information that will also bring people to doctors when it is necessary that they do so. Increasingly, people want to avoid going to doctors because with internet, they feel they have the necessary tools to self-diagnose. So content marketing for healthcare should always know its limits–giving precise enough information that people can get a sense of what kind of a problem they’re dealing with, but knowing where to call people to action– to see a doctor. Most businesses don’t have to deal with this kind of subtlety in marketing, being able to simply provide content and advertise their business alongside the information. Health care providers should be drawing on the techniques of inbound marketing to support the mission of their marketing strategy. Unlike traditional marketing, inbound marketing–also known as “permission marketing” by some–is all about drawing people in by producing content relevant to them. Traditional marketing employs the “cold calling” approach, wherein you are likely to get interrupted during your day with unsolicited advertisements. This can work in certain circumstances of course, but the principle behind inbound is that the client/patient/customer is more likely to be receptive if they are already going looking for you. Say perhaps that someone in the greater Philadelphia area is looking for information on back pain that they just started experiencing. They might type into a search engine a phrase such as “philadelphia back pain types” so that they can get doctors in Philly that specialize in orthopedics, while also finding out about what’s going on with their body. Your content marketing for healthcare should target these kinds of searches, bringing potential patients to your website to learn more about what’s ailing them and also how to get more help. They will be learning more about self care and also know how to find you! If you are looking for a marketing agency that specializes in health care practices, then seek no further. At Farotech, we’ve served healthcare providers of all types with many of their marketing needs, including sometimes their entire campaign. We are distinct for our collaborative style and team spirit, which we bring to all of our clients. We hope to be able to help you represent your practice well and how you envision its online presence. Call us today at 267.387.6620 for more information.